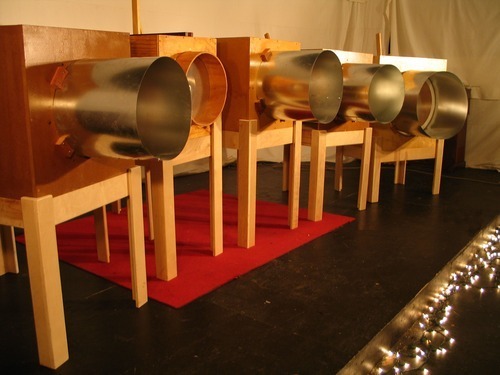 Loop-scavenged, composed for three intonarumori, premiered at the Austin New Music Co-op’s 2005 show, Beyond the Past: New Works for Extinct Instruments. In an ambitious program more than two years in the making, the Austin New Music Co-op will resurrect innovative instruments designed at the turn of the century (the 20th century, that is) for an exciting concert of new works. Modeled after the inventions of Luigi Russolo, these hand-crafted instruments will be premiered alongside other traditional instruments in eight new works by member composers of the NMC. This combination performance, art exhibit, and history lesson is a rare opportunity to experience “futuristic” music of the past. 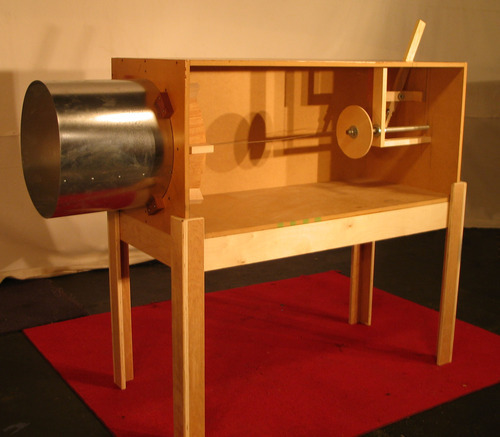 Loop-scavenged examines the range of Russolo’s intonarumori by using each one as the generator of a fixed sound, with the performer focusing on making his part sound machine-generated. The intention is to create a simple structure that contrasts with the organic, raw sound of the intonarumori, and yields an environment that is at once mechanical and organic. The piece borrows its title from a specific design of two-cycle internal combustion engine that operates in much the same way as the three parts in the piece. It’s interesting that our perception of the organic qualities of sound has changed so much since the invention of the intonarumori; what then was perceived as harsh, mechanical and crude now feels more natural in comparison to the hum of a computer, the ring of a cell phone, the compression of an overdriven car stereo or the buzz of an electric guitar.